The Catholic Jedi Academy: Sitting Bull May Not Have Been Catholic, But There Are Plenty of Lakota (Sioux) Who Are and They Could Use Some Support! 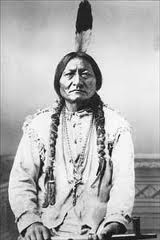 Sitting Bull May Not Have Been Catholic, But There Are Plenty of Lakota (Sioux) Who Are and They Could Use Some Support! There's been a flurry of posts on the blogs this week about whether or not Sitting Bull was Catholic. The interest seems to have been sparked by a picture of the Lakota chief wearing a crucifix around his neck. 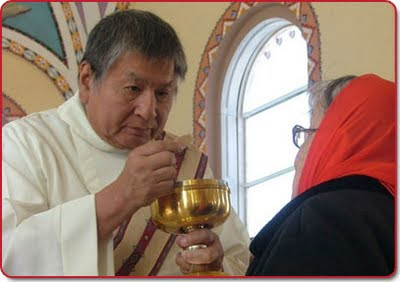 Well, it's not clear whether Sitting Bull was or was not Catholic, but what is certain is that the Lakota (Sioux Indian) people are still living on the Rosebud reservation in South Dakota and are still ministered to by the "black robes" (a/k/a Jesuits). St. Francis Mission was established to provide spiritual and material sustenance to the native people and has been doing so for over 100 years. In fact, as I mentioned in a previous post, it was the chiefs Sinte Gleska and Red Cloud who petitioned President Rutherford B. Hayes to send the Jesuits to the Sioux people because of their reputation for trustworthiness, holiness and the ability to teach. Since that time the Society of Jesus, along with the Lakota people, have established several parish churches, erected a radio station, constructed schools and initiated and maintained social outreach programs. St. Francis Mission is undertaking a fund raising drive online. I'm glad to give them another plug and encourage others to support their much needed work for the Lakota people. Often when one thinks of contemporary Native Americans, one thinks of casinos and thriving economies. For the Lakota people, this is far from the truth. Poverty, addiction, and mental illness often are the scourges of modern reservation life. On the Rosebud reservation, especially, the need for programs and funds to address these problems is great. Please, if you're able, take some time to go over to the St. Francis Mission website: www.sfmission.org and see what they've been accomplishing. Or take a look at Father Hatcher's Youtube video where he talks about their great work. The native people have had a hard life. And, while Sitting Bull may not have been Catholic, these folks are. Thank God for those who are willing to reach out and lend a hand.